I am going to review these amazing products that i have only just come across. They are honestly FAB! As you already probably know i am a lip gloss fanatic and this gloss is stunning. Luminous Volume Gloss has pigments which make the lips appear fuller, they are very moisturising and barely sticky. •Apply as needed to moisturise and plump the lips. Apply to clean, dry lips with a brush throughout the day for seductive volumised shine. •Can be applied under or over lip colour and/or pencil. I also love the colour, it's a gorgeous metallic pink. This shade is called 'Allure'. Next item i got was the Liqui-Gel Stain in 'Flouron'. Honestly, when i opened the package this gave me a fright! It looks so florescent, but when applied it isn't at all. It leaves a beautiful 'flushed' pink on the cheeks, it's very doll like. You can choose if you want it more noticeable or extremely subtle, which is how i like it. It blends extremely well which i find a huge problem with other cheek stains. Another great thing is that Beaute offer different shades to compliment different skin tones. This is one of the best cheek stains i have come across. 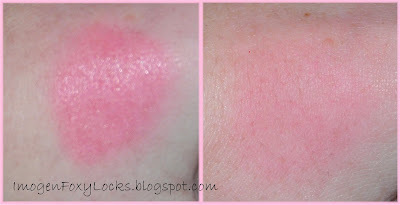 The first swatch is minimal blending, and the second swatch shows what a beautiful pink in turns into once blended well. My opinion on Beaute products? Amazing! I wish i could buy them all, they are just lovely. I highly recommend them. I'm loving the pink metallic lip gloss! Pink is my new color! I just bought the pink metallic lipgloss! I had to have it after seeing it on you! Newly found blog. Im now a follower. Ooooh prettyyy!! Love Allue what a gorgeous colour!! !